David is the founder and President of the David Allen Company, whose inspirational seminars, coaching, educational materials and practical products present individuals and organizations with a new model for “Winning at the Game of Work and Business of Life.” He continues to write articles and essays that address today’s ever-changing issues about living and working in a fast-paced world and attaining a work-life balance. He lives in Ojai, California with his wife Kathryn. 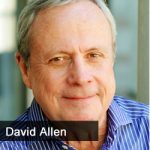 David is the international bestselling author of Getting Things Done: the Art of Stress-Free Productivity and Ready for Anything: 52 Productivity Principles for Work and Life.